Septate uterus is caused by incomplete resorption of the Mullerian duct during embryogenesis. Here, we report a case of septate uterus that was initially diagnosed by hystersalpingography and ultrasound scan that was successively treated by hsyteroscopic resection but it was complicated with uterine perforation and was confirmed by laparoscopy. 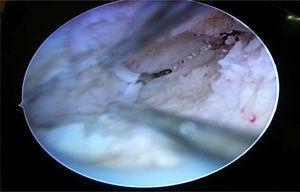 Operative hysteroscopic procedures are risky than diagnostic ones. Half the complications were entry-related. The other half of complications were related to surgeons’ experience and type of procedure. O útero septado é causado pela reabsorção incompleta do duto de Muller durante a embriogênese. Nesse artigo, relatamos um caso de útero septado que, inicialmente, tinha sido diagnosticado por histerossalpingografia e ultrassonografia e que foi sucessivamente tratado por ressecção histeroscópica; mas esse caso foi complicado por perfuração uterina confirmada por laparoscopia. Os procedimentos histeroscópicos operatórios representam maiores riscos, em comparação com os procedimentos diagnósticos com essa técnica. Metade das complicações tinha ligação com a introdução. A outra metade das complicações estava relacionada à experiência dos cirurgiões e ao tipo de procedimento. A 25 year old lady, G0P0, was admitted to Shatby maternity university hospital. She was infertile for 3 years. Her menstrual history was normal. There was no family history of any abnormities related to uterus. She had done HSG that revealed complete uterine septum (Fig. 1). Ultrasound was performed showing septate uterus with no adnexal masses. 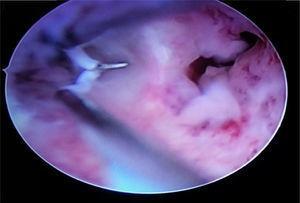 Hysteroscopy was performed revealing complete septum extending to the internal cervical os (Fig. 2) that was resected (Fig. 3) by 90 degree needle electrode till both tubal ostia were visible at same plane but uneventfully uterine perforation (Fig. 4) occurred, so laparoscopy was done to cauterize the perforation area and inspect the bowel with other organs for diathermy lesions. The postoperative period was smooth and the patient was discharged after 2 days. She was instructed to deliver by elective cesarean section. HSG showing complete uterine septum. 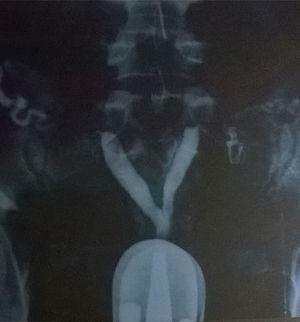 Hysteroscopic view with both cavities seen. 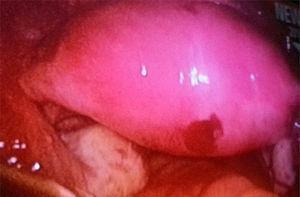 Resection of the uterine septum. In conclusion, the diagnosis of septate uterus as a congenital anomaly can be achieved easily with HSG, US and MRI. It can be corrected by hysteroscopic surgery and thereby decreases the rate of abortion for women greatly with low incidence of uterine perforation according to skill of the operator and extent of lesion. Uterine anomalies. How common are they, and what is their distribution among subtypes? Notifique-me quando uma nova edição da revista estiver disponível.